I think bronzer is one of the hardest makeup products to buy. 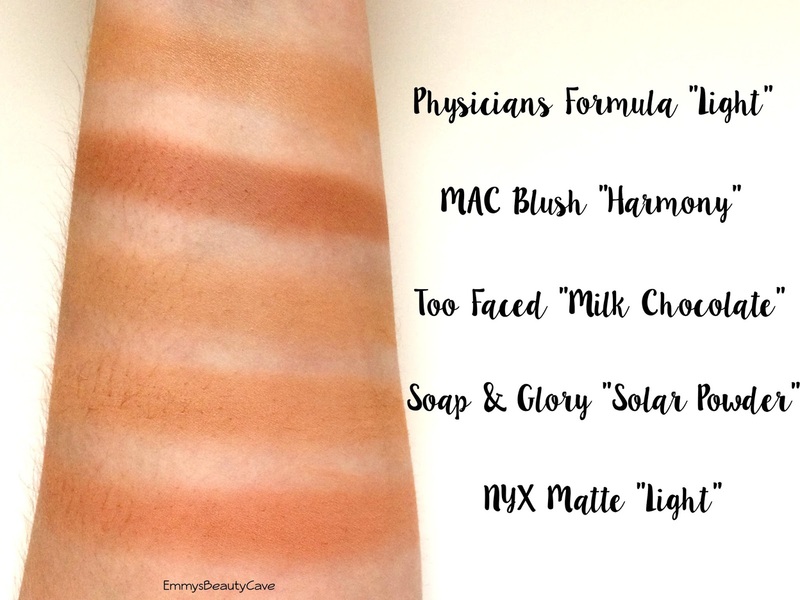 Finding a shade that is right for your skin tone isn't easy. I recently decluttered my makeup and threw away alot of bronzers because they were either too dark or full of shimmer. I prefer a matte bronzer on my skin as I like to use highlighter and sometimes a shimmery blush. I was suprised when I saw I had five bronzer's I actually loved and didn't hate any of them. 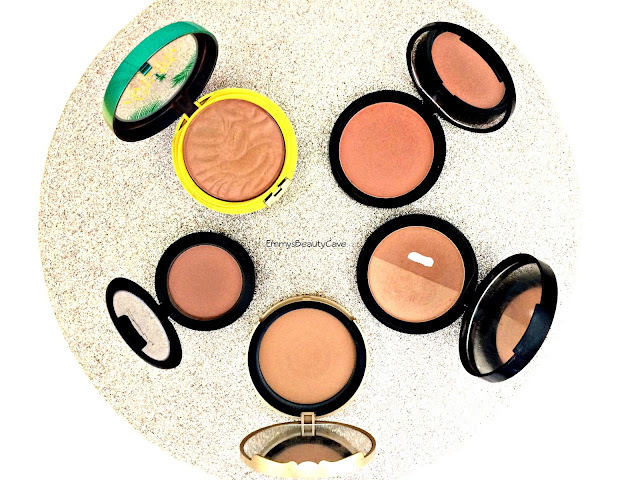 I am quite pale and tend to find most bronzers especially drugstore ones show up orange on me. Finding the right shade of bronzer can be difficult as some are warm toned, cool toned and neutral and my skin can vary. Some of these bronzers can be used for pale or medium skin tones but I love them for different reasons. I adore this bronzer, how cute is the packaging?! I actually stocked up on this whilst I was in NYC in November. I have one im using now and two backups. I have the shade light but you can also buy a darker shade. This smells like coconut and chocolate! This works perfectly on pale skin, on the swatch it does have a slight glow to it but on the skin it isn't shimmery at all it just makes your skin look healthy. This is technically a blush but I use it as a bronzer or a contour shade. This is the darkest of the bunch but in the swatches it was built up so you can either have a light bronze or build it up if you are slightly darker than me. It blends beautifully. I have been using this over a year now. Too Faced have this in three shades so there is a shade for everyone. I find it is the lightest out of the ones I own but you can build it up. I love using this on the days I want a more natural look. If you want an affordable bronzer this is it, it looks natural but adds warmth. The shade is perfect on pale skin. I find I try to use my high end bronzer's when I am going and doing something whereas I will use the drugstore ones for day to day wear. When you look at all the bronzers in the pan the NYX one looks the darkest but as you can see in my swatches it isn't the darkest at all. When I first purchased this and looked in the pan I was worried how dark it looked but it doesn't apply dark on the skin. It adds a nice amount of warmth to my complexion. If you are paler than me I wouldn't recommend this one as it is on the warmer side. This does come in seven shades which is amazing for a drugstore product. I adore all five of these products. If you are paler than a MAC NW20 I would suggest the Too Faced or Soap and Glory Bronzer but if you are like me any of the above would suit you well.